The IP telephony based on Asterisk advantages assist of use expansion as in the business so in the public segment of the voice services. It is very popular integration with Triple+ service, where client is connected by the one optical cable to the Internet, television and modern telephony network with many additional communication possibilities between subscribers. Virtual telephone exchange MetPBX connection together with the auto configuration server GenieACS allows maximally automatize setting and exploitation of network. Special software was developed for management integration of clients services from billing. Modern information technology distribution from the middle of 90s is based on PON (passive optical networks) technology, which requires no active electrical components between the end-user and the provider central office. Since the huge development of network, various standards have been established and matured. PON developed from the first ATM PON (APON) and then evolved in Broadband PON (BPON) which is compatible with APON. Later, arisen Ethernet PON (EPON) and Gigabit PON (GPON) bring great improvement in data transmission distance and bandwidth. 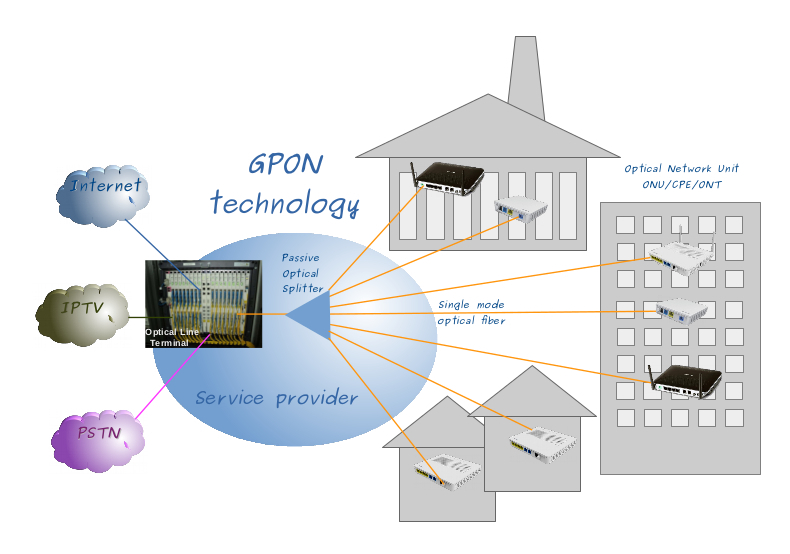 This tutorial will introduce about best one GPON technology. GPON is defined by ITU-T recommendation series G.984. It represents an increase in bandwidth compared with APON and BPON at range up to 20 km. ACS (auto configuration server) is the cost-effective solution for building GPON by the carriers. Initial configuration (such as service system information and data) are required on ONT/ONU/CPE before than they can be put into use. The laboratory tests is show benefits using GenieACS with Huawei hardware for end-user auto configuration management VOIP, video and Internet services. This approach make possible to put into use Customer premises equipment (CPE) Plug and Play “from the box”. Our company is integrate different service provider network software into whole, that automatically process various services scenarios on user choice by the billing demands.